Featuring Billy Crystal, Whoopi Goldberg, Norman Lear, Jerry Lewis, Kim Novak, Quincy Jones, Paula Wayne, Todd Boyd, Burt Boyar, David Steinberg and archival footage of Sammy Davis Jr. Distributed by American Masters Pictures. 100 minutes. Not Rated. I did not expect to see so many people in the audience at the 2017 Philadelphia Film Festival screening of Sammy Davis Jr.: I’ve Gotta Be Me, the 2017 documentary about the life and work of the legendary entertainer. Did the crowd come to see the Q&A with director Sam Pollard and editor Steve Weschler? Maybe, but more likely the audience came to learn about and celebrate the life of Sammy: the child performer, the dancer, the singer, the survivor, the rebel, the leading man, the activist, the hipster. Pollard’s documentary covers all of these sides of Sammy Davis Jr. mixing film footage through his lifetime – from age three until his death at age 64. It highlights the life of a man who challenged societal norms wishing to live his life without boundaries, like imagined in his hit song, “I’ve Gotta Be Me.” As a childhood performer, Sammy never had a day of formal education, and yet through his interviews and footage, we are reminded of his eloquence – in speech, in movement, in his overall comprehension of the world around him. It starts, deliberately, with some of his more controversial moments – the Nixon hug, Dean Martin holding him like a small child thanking the NAACP for the trophy, and addressing the 1972 Black Expo after being considered a sell out to his race. In interview highlights, he describes how it felt to be booed by an audience after 40-50 years of being considered “Mr. Entertainment” because of his politics. In the Q&A session after the screening, Pollard advised that he had never had the opportunity to meet Sammy Davis Jr. in person, but grew up watching him on The Ed Sullivan Show. He always admired his talents and complexities. It must have been difficult to cull down a lifetime of stellar performances into documentary highlights, so you know that the chosen few are some of his most impressive pieces. One of the most noteworthy dance/musical highlights, also a favorite of editor Weschler, was a clip of Sammy tap dancing in a call & answer number with two drum set players. The rhythm is flawless as each artist works off one another. The drum sets, placed on a moving platform, move forward with Sammy and then he drops back to completely take over the stage with his movement. It is a breathtaking scene that I had never seen before. A second favorite highlight was near the end of the documentary, when they show a performance clip from the final tribute to Sammy, just eight weeks prior to his death in 1990. He taps with Gregory Hines (who also passed away, in 2003) and I had to reach for my tissues. 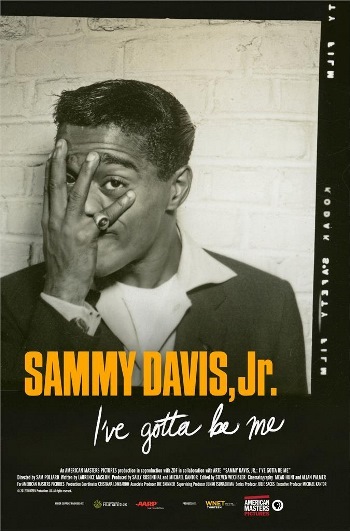 Sammy Davis Jr: I’ve Gotta Be Me is a documentary balanced with a combination of dance, music, and personal drama. For an audience that grew up with Sammy, this will be a journey of well-highlighted nostalgia. For today’s generation, who may know Sammy only as an iconic name, this will be a who’s who of entertainment history with more than enough drama to keep them entertained. Sammy’s life story is impressive, captivating, challenging, and meant to be told. Copyright ©2017 PopEntertainment.com. All rights reserved. Posted: November 1, 2017. Tags: American Masters, Billy Crystal, Black Expo, Bonnie Paul, Burt Boyar, David Steinberg, Dean Martin, Gregory Hines, I've Gotta Be Me, Jerry Lewis, Kim Novak, movie review, Mr. Entertainment, NAACP, Norman Lear, Paula Wayne, pbs, PFF26, philadelphia film festival, PopEntertainment.com, Q&A, quincy jones, Richard Nixon, Sammy Davis Jr., Steve Weschler, The Ed Sullivan Show, Todd Boyd, Whoopi Goldberg. Bookmark the permalink.